And I totally agree about Jack. Not once did I catch on that he was supposed to be gay. As a matter of fact, I could never get over what the big deal was, why anyone would care that there were two women and a man sharing an apartment -- and I was 18 in 1980!! I used to tell my little sister that gum was like biting into a juicy bug. I've never heard of this gum. I'm kind of a huge fan of the flavor bursts gum, so maybe I'd like it. But the whole squirting issue would be a problem for me. I just can't bring myself to enjoy perverted foods. Nope. Oh my. I loved this gum but only for the first 2 minutes because the flavor disappeared pretty quickly. True story, I was 9 years old and had just read Robin Hood and His Merry Men. The book taught me a new word, gay. Course it taught me the original meaning of happy. So this one day I'm walking by this poster that has a picture of a guy with a huge smile on his face. My brother was there and my mother as well. There were a bunch of other people there too. Anyways, I exclaim quite loudly, "That guy looks gay!" Needless to say my mother flipped out that I would be hollering such a statement out loud. My brother was bent over laughing. And I had no idea what the big deal was. This was my FAVORITE!!! Along with that other gum that you bit into and it was full of crystals in the middle. I can't remember what it was called though. I SO REMEMBER THIS! So funny! It's like those fruit snacks, but lasts longer. Geez, I haven't thought of that gum in FOREVER!!! my favorite gum to this day is spearmint bubble gum, by...hubba bubba? bubbalicious? anyway, I've never seen spearmint bubble gum, except in the 80's... :( rats. Love this stuff as a kid and now I am a little disgusted by the thought of it. My kids love Gushers. Kinda the same idea. I wonder what that goo is made of. I mean, besides sugar. I think it is so funny you brought up Three's Company. If you go back and look at the show, it was totally inappopriate for kids to watch, but there I was, all the time, watching it. I knew that Jack was pretending to be gay. I am amazed that being gay could even be discussed on TV back then. 3's Company was dirty? Next you'll tell me the show Soap was raunchy. 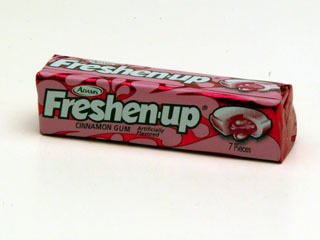 FYI...Loved Freshen Up gum. The squirt in my mouth was all I lived for in the 80s. Um. I totally forgot about that gum. I'm pretty sure that I liked it. I haven't seen it in my area in many years. My friend found some locally in NC, but I think the place went out of business. I LOVED this gum. There was also a Dr. Pepper version that I really liked too! We actually sell both flavors of this stuff at the store I work in. We try to remember back and think of some of the old stuff and bring it in if we can get it from our grocery company. I live in NC. If you know of a gas station that uses JT Davenport as their grocery delivery company then you should ask them about it. That is where we get it from.